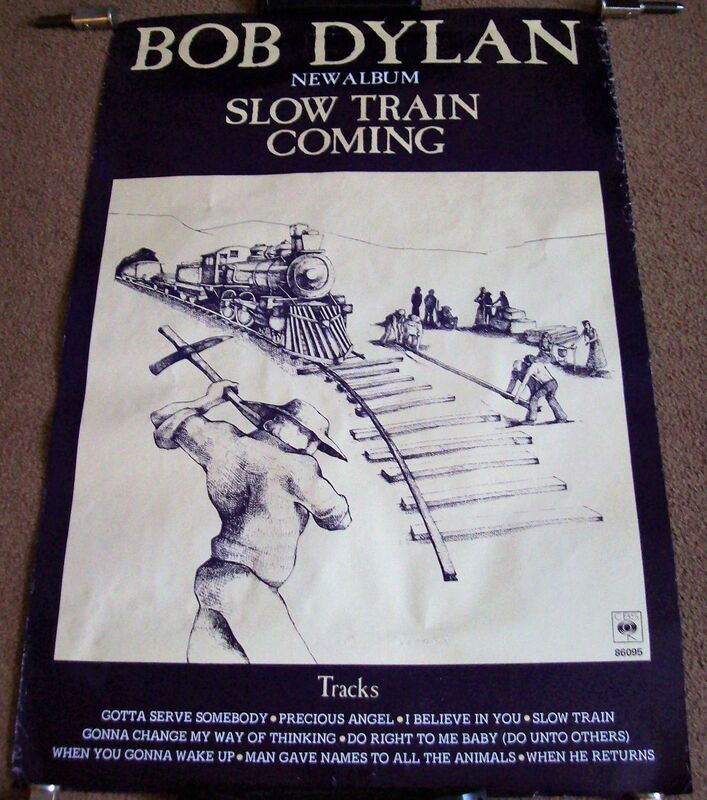 THIS IS THE OFFICIAL AND THE ORIGINAL U.K. RECORD COMPANY PROMO POSTER FOR THE RELEASE OF THE ALBUM “SLOW TRAIN COMING” BY THE QUITE SUPERB AND LEGENDARY MR ‘BOB DYLAN’ IN 1979. THIS REALLY IS THE MOST STUNNING AND RARE POSTER THAT IS IN A VG/VG+ CONDITION WITH A LITTLE BRUISING AROUND THE EDGES….IT HAS A CONSERVATION TAPE REPAIR IN THE MIDDLE OF THE BOTTOM HALF FOR A SMALL TEAR….AND A LITTLE GENERAL AGEING HERE AND THERE!!!! IF YOU’RE A FAN AND COLLECTOR OF THIS GREAT GENIUS THEN YOU SIMPLY MUST HAVE THIS POSTER FOR YOURSELF!!! IT MEASURES 20 INCHES 51 CM WIDE AND 30 INCHES 76 CM HIGH….AND IT WOULD SO BENEFIT FROM BEING PROFESSIONALLY MOUNTED GLAZED AND FRAMED….IT WOULD LOOK STUNNING FOR SURE…..IT’S A BEAUTY!!!!! AS I OFFER THE VERY BEST SERVICES AVAILABLE, THESE POSTERS WILL BE SHIPPED IN SPECIALLY MADE, SPIRALLY WOUND, POSTAL TUBES, WHICH ARE PRACTICALLY BULLET PROOF!!!! THEY WILL BE SEALED WITH PLASTIC END CAPS, AND SECURELY TAPED DOWN FOR EXTRA SECURITY!! THE TOTAL PRICE INCLUDES POSTAGE, PACKAGING, AND HANDLING!!!! ALL PARCELS WILL BE SHIPPED VIA THE ROYAL MAIL INSURED ‘SIGNED FOR’ SERVICE OR A COURIER SERVICE, WITH A TRACKING NUMBER PROVIDED TO COMPLY WITH THE PAYPAL BUYERS PROTECTION SCHEME!!!! ALL ITEMS ARE GUARANTEED 100% ORIGINAL AND GENUINE UNLESS OTHERWISE STATED. PLEASE CHECK OUT MY FEEDBACK AND BUY WITH CONFIDENCE!!!! Mint = new or as new. never opened or used in near perfect condition. Ex+ = shows little or no sign of any wear and tear. Although it has been opened and used it is complete and intact. Almost new. Ex = shows very minimum signs of ageing and wear and tear. Complete and intact. VG+ = Better than VG. Signs of ageing and wear and tear and possible small edge nicks. Possible restoration. Complete and intact. VG = Obviously shows signs of ageing and wear and tear. Possible small to large folds. Possible restoration. Good = Possible overall quality deterioration. Obvious signs of ageing, wear and tear, folds and creasing. Possible paper/parts loss. Possible restoration. Acceptable = Obvious paper or parts loss. Obvious damage, ageing, wear and tear, folds, tears, creasing. Possible foxing. Major restoration. Poor = Large parts of the item are missing or badly damaged. Major restoration needed.